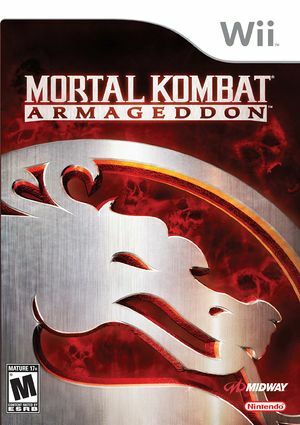 For the first time ever on the Wii, players will be able to experience the latest chapter in Midway’s award-winning, best selling video game fighting franchise, Mortal Kombat: Armageddon. With the most complete roster ever, including more than 60 fighters from the entire Mortal Kombat universe (past, present and future), a revolutionary Kreate-A-Fighter mode and Kreate-A-Fatality mode, plus a brand new Konquest mode and Endurance Mode, Mortal Kombat: Armageddon promises to be the most complete, intensely lethal, fighting experience ever! Mortal Kombat: Armageddon is capable of using both GameCube controllers and Wii Remotes. If a physical controller is set to emulate both a GameCube Controller and a Wii Remote concurrently, it will operate both devices at the same time. To fix, migrate controls to use separate physical controllers. The player's shadow has small rectangles surrounding it when IR>1x. To prevent that, turn off Scaled EFB Copies or set "Internal Resolution" to Native. The graph below charts the compatibility with Mortal Kombat: Armageddon since Dolphin's 2.0 release, listing revisions only where a compatibility change occurred. This page was last edited on 3 March 2018, at 07:44.